As I slowly transform myself from an elementary educator who comes home too tired to do anything but eat, read, and watch TV to one who arrives at home motivated to tackle projects that have been waiting months (and in many cases, years) to be done, I learn something new every day! 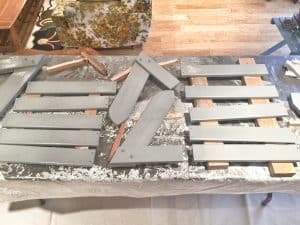 Not only am I learning skills to refurbish furniture that has been begging for a fresh coat of paint (or more), but I’m also learning how to get motivated, effective time management techniques, and what it is exactly that I really enjoy doing. At the end of each month I reflect on what I was able to iccomplish* and why, make adjustments for the next month, and set up a new plan of action. Before selecting the projects for January, I reflected on the first four months of the School Year Challenge, reviewed my original goals, and adjusted the purpose of the School Year Challenge from transforming a room a month to completing random projects around the house that have been on my mind for years. 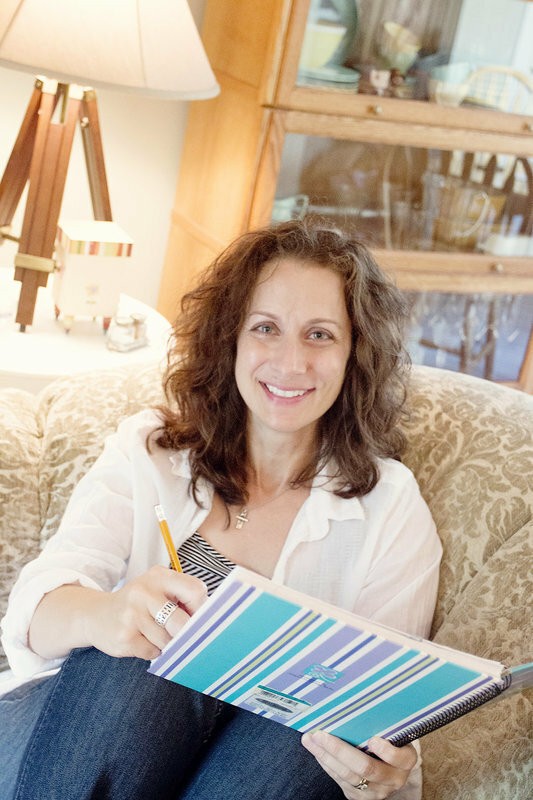 To help balance my time in January, I used a few ideas I learned in a free webinar by Ruth Soukup, the founder of Living Well Spending Less® . 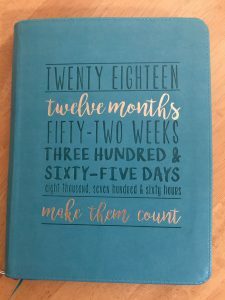 For Christmas, my sister gave me a personal planner that I fell in love with…the color, the words on the front, and the zipper all make me happy on the inside! Thankfully, it has the monthly and weekly calendars I needed to implement the tips Ruth shared to help me manage my time. The first tip was to use the view of the entire month to write out all of my obligations and tasks that needed to be done as well as my Iccomplishment* projects for the month. 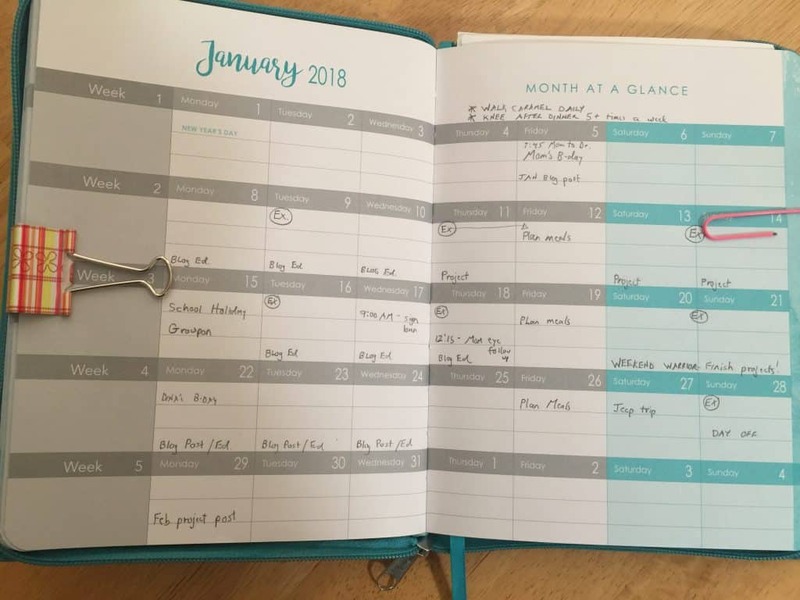 As I filled out the calendar, I kept in mind my goal for January was to limit the number of projects, get them done by the third week of the month, and type up the end-of-the-month post during the last week of the month. By not planning too many projects, my hope was to have time for other things that I enjoy doing (i.e. plan meals, cook dinner, a Jeep trip or two, continuing education, read)… things that I just didn’t do and/or relied on my husband, Douglas, to take care of for the past several months. 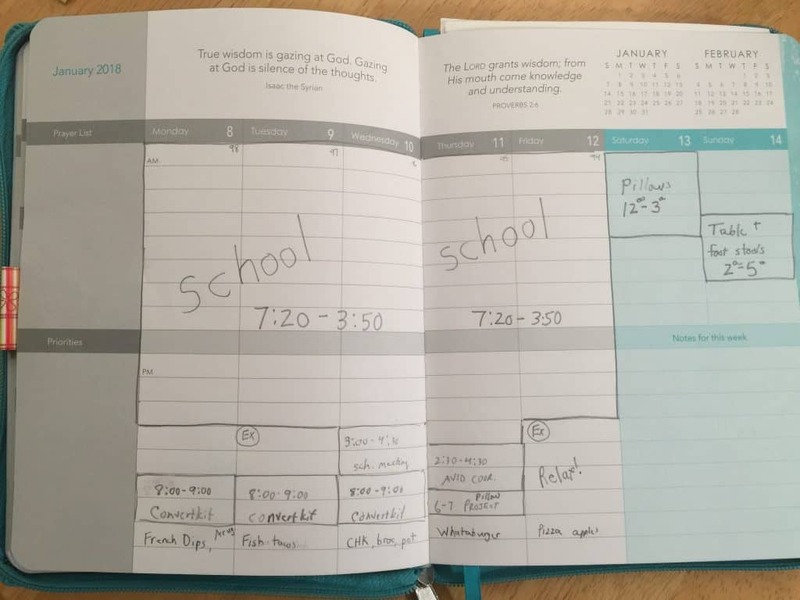 The second tip was to fill in the weekly view by sectioning off blocks of time during each day. Ruth called this time-blocking. I used the weekly view to fill in the blocks of time that were non-negotiable (like my full-time teaching career). Then I could see what time I had left to complete the other tasks that were important and block off time to do them. The third tip I tried was to write down the meal ideas for each night at the bottom of each week day. That way I could plan weekly grocery shopping and have what I needed to cook at home. 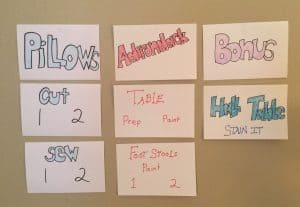 In addition to these new planning ideas, I created the note cards for my Project Wall. This is a visual I have used since the beginning of the School Year Challenge. I hang it on my bedroom wall so I see it everyday. It has helped me stay focused and accountable each month. So, I started the month with a fantastic plan of action. I knew what I needed to do and when I was going to do it. 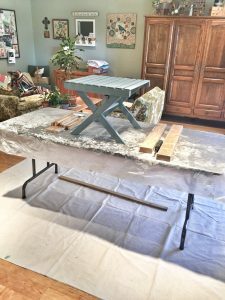 I had projects that have been on my to-do list for a long time that I knew could be done during the month. I had planned out meals, time for continuing education, and even a couple fun outings. January was going to be the month when the projects I selected could realistically be completed leaving me with time to participate in other activities I enjoy! What I didn’t plan on was getting the flu and Caramel, our dog, getting sick. Flu symptoms for me started on Thursday, January 11. I went to the clinic on Saturday, Jan. 13 and I was pretty much out of commission until Sunday, January 21. I tired easily and had little energy (and not because I was working too hard). Even after going back to work, I still felt tired and was in bed by 9:00 pm for another week. Caramel became lethargic about the same time I had the flu and wasn’t eating or drinking. Thankfully, Douglas did not get sick and could take care of us. Thank goodness both Caramel and I have recovered! However, while being sick provided an excellent reason to stay in bed and read (when I was awake), it wrecked havoc on my timeline of a fun and productive January! As you can see, the two main projects (pillows and Adirondack table/foot stools) were iccomplished*! 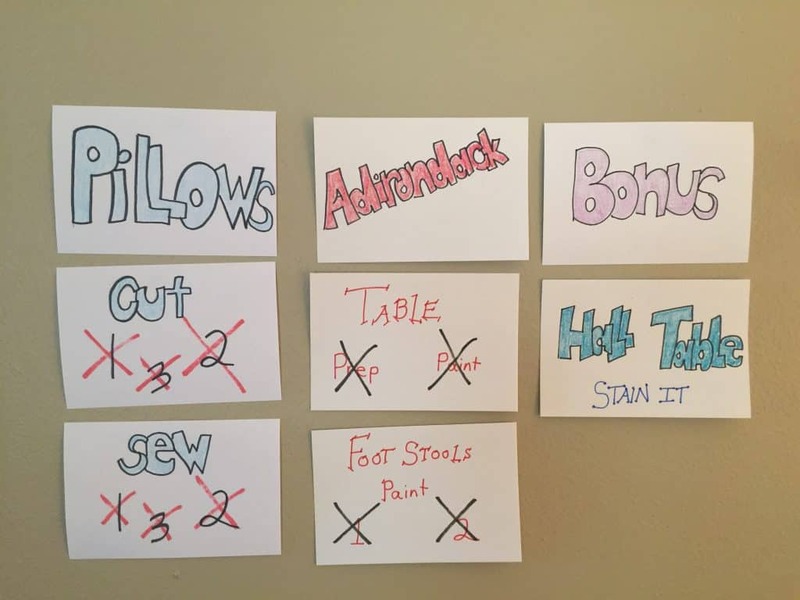 When I made the Project Wall cards at the beginning of the month (see smaller picture above), I had put 2 pillows to cut and sew because there were two fabrics. I obviously wasn’t thinking because there were actually 3 pillow forms! 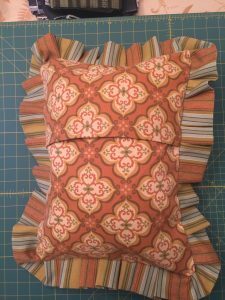 Several years ago I had purchased stuffed pillow forms and made covers in a colorful spring fabric. They sat on my covered front porch for longer than a couple seasons. 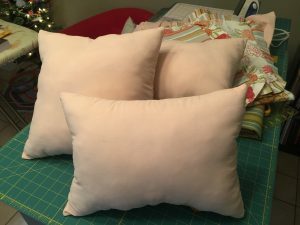 When I eventually brought them inside to remove and wash the covers, the thin fabric covering the stuffing came apart on all 3 pillow forms. 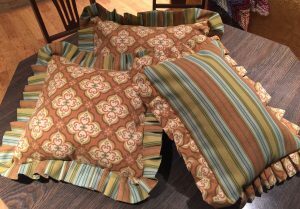 I’m not one to throw things away if I have a plan for them, so instead of dealing with the deteriorating pillow coverings, I put all three pillow forms in a bag and put them under my cutting table. 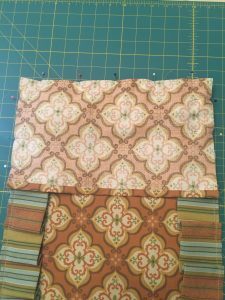 Fast forward to January’s projects and I was finally ready to use the coordinating warm-toned fabric (that I had bought at the same time I bought the spring fabric) and make the pillow coverings. Next, I sketched out the pieces I would need for the two different size pillows (one is square and two are rectangles) and did some math to figure out the measurements. 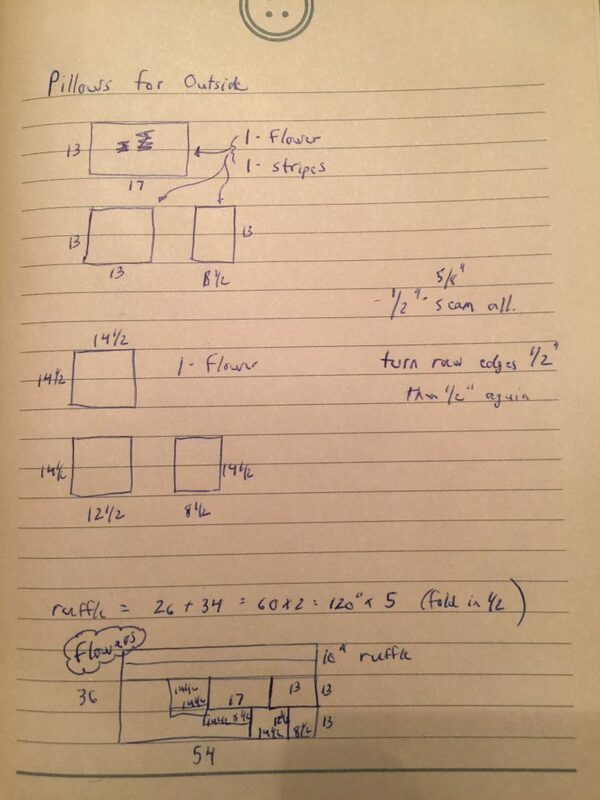 I also sketched out how to cut the pieces from each fabric. 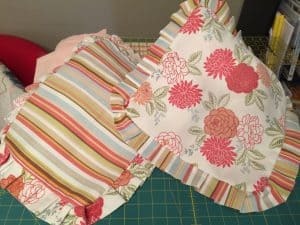 After cutting the pieces out, I pinned a ruffle to the front of the pillow by creating a pleat every inch or so and then sewed it down. Then I pinned the two back pieces on. 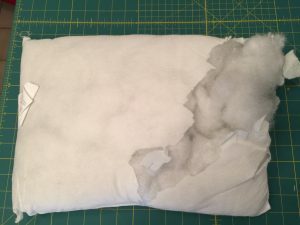 These two pieces overlap so the pillow can be inserted and removed from the cover easily without having to use a zipper. I sewed both pieces down and turned the pillow cover right side out. Then I inserted the pillow and plumped it up. The first pillow was finished! The second and third pillows went a lot faster than the first one because I had figured out what to do. 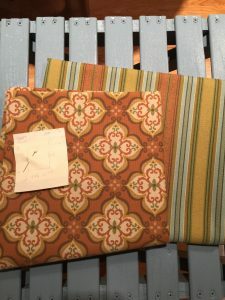 When I laid all the pillows on the table to admire them, I realized that the pillows looked a little dated …coordinating fabrics with a ruffle. Hmmm. 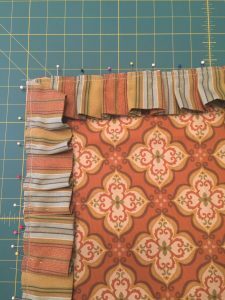 This was my original plan of action several years ago and it didn’t even cross my mind to investigate and search for a more current looking pillow cover that I could make with the material I already purchased. Now, it’s not that I’m unhappy or disappointed with how the pillows turned out because I am thrilled at what I was able to iccomplish*. Instead, I had an epiphany that not just this project, but many of the projects I have been thinking about for the last few years may be outdated! This is definitely something I need to consider as I move forward with turning my thinking into doing! These three pieces of furniture are part of a set that includes the chairs we painted in December. 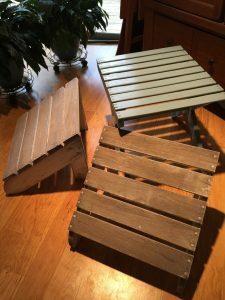 The footstools were prepped and ready to be painted. 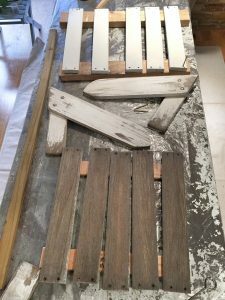 The table needed to be sanded because the paint color was not quite what we wanted when we first started working on this deck furniture in November. Due to the fluctuating temperatures in January, we set up a painting station in the living room. My original plan was to paint the furniture on Jan. 13 and 14. What I didn’t get done would be part of a Weekend Warrior effort on Jan. 20 and 21 to complete any remaining projects for January. I gratefully agreed to his offer! Not only was I stricken with the flu, but I knew in my soul that I much preferred the sewing projects! Douglas was a beast and knocked out the footstools and table in no time! 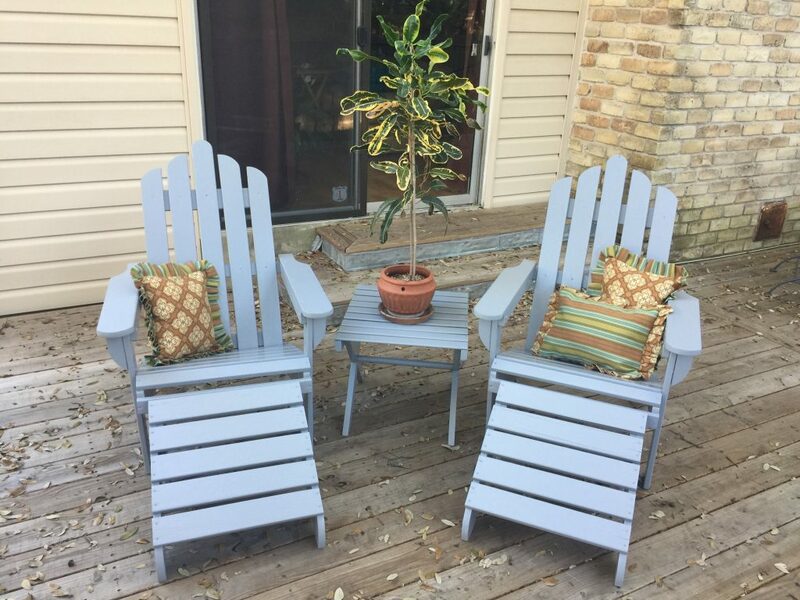 The Adirondack furniture and pillows look fantastic! The total cost of these projects was $0.00. That’s right, nada! We had all the supplies for the pillows, footstools, and table and didn’t have any unexpected expenses. Whoo hoooo! My selection of February’s projects will definitely be limited again so I can make progress on turning my thinking into doing and at the same time not be overwhelmed. Time-blocking is definitely something I am going to do in February when planning for each week. I liked how it made time visible for my monthly projects and other things I need to get done during each week. However, meal planning is not something I will include again. For me, it was an extra planning step I really don’t need. I prefer to plan for 6 meals for the week, shop for all the ingredients, and then cook what sounds good on each night. It is hard to believe January is over and February is here! It seems like yesterday that I was making the Raggedy Ann tree skirt! I’m looking forward to another month of iccomplishing* more projects!